American Robin by Laura Meyers via Birdshare. 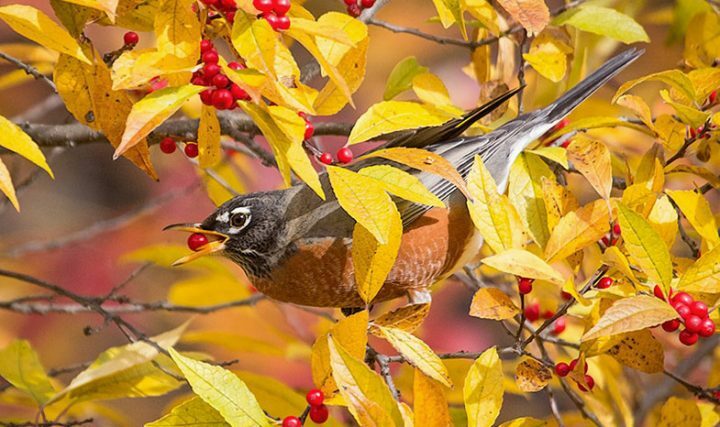 These are some of our favorite plants and trees for birds—but they may not work for all regions. Planting native vegetation is always your best bet—use our YardMap tool to get specific planting recommendations based on your zip code. Description: Often large trees, may grow up to 150 feet tall. Food type: Seed-bearing cones. Its evergreen needles are a good source of insects in early spring. Attracts: Crossbills and other seed-eaters in fall and winter. Migrating warblers search for insects in spring. Attracts: Robins, bluebirds, thrushes, catbirds, cardinals, orioles, Wild Turkey, Pileated Woodpecker, mockingbirds, thrashers, many others. Attracts: Tree Swallows (especially wintering), catbirds, bluebirds, many others. Attracts: Robins, bluebirds, waxwings, others.